Stinson lake is located 20 minutes north of the College town Plymouth NH, this deep water glacial lake is over 300 acres and is surrounded by wilderness and plenty of hiking trails are steps away. This four season retreat with 300 feet of waterfront on pristine Stinson Lake, one of New Hampshire's best kept secrets. Enjoy sun filled days and moonlit nights from the comfort of your living-room, second level deck or from your very own park-like picnic area at the water's edge. Spend the day on the lake and then sit back and enjoy a lakeside barbecue or just relax and gaze at the lake and mountain views. Set on over 6 acres this two level home has lots to offer. This 12 room home offers a living-room with wood burning fireplace, kitchen with island, granite counter-tops and breakfast nook and a large recreation room for the kids. A screened-in porch that is perfect for summertime meals leads to the upper level open deck. Lots of storage and plenty of room for the whole family. What are you waiting for, make this Stinson Lake waterfront your year round home or four season destination. Listed by Maxfield Real Estate. 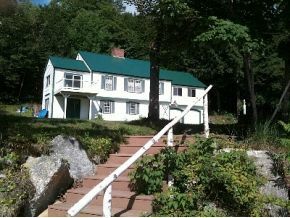 For additional information on this home call Lady of the Lake Realty at 1-888-737-5550 or e-mail at info@nhlakesrealty.com or visit our website to view similar lake homes in New Hampshire at www.lakeorskirealestate.com. Contact us today to see if this home is still available? ?